Spearheaded by SIFAA, commonly known as 'Nadigar Sangam', the film fraternity is observing a silent protest and there was a huge turnout with most of the big names Vikram, Sarath Kumar, Prakash Raj Bhagyaraj, Radha Ravi, Sathyaraj, Sivakumar, Suriya, Karthi, Bharat, Udhayanidhi Stalin, Dhansika, Monica, Vishal Krishna and Chandrasekhar, among others, joining the fast at Nadigar Sangam premises at T. Nagar here. However, there were no mikes and no speeches. "One of the reasons we are not using microphone is that we don't want tempers to flare. If given an opportunity, people will vent and unnecessarily create tension," a member of SIFAA told IANS. 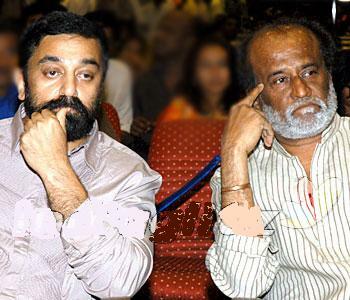 Kamal, Rajinikanth, Ajith Kumar, Suriya, and Karthi are among those who couldn't join the March 19 fast. All activities with regard to the Tamil film industry have come to a standstill. Ajith Kumar was supposed to start shooting for his new Tamil film Tuesday, but he postponed the same to participate in the fast. All theatres in the city will remain shut during the course of the hunger strike.